At New York JFK Airport, Alaska Airlines operates out of Terminal 7. The terminal is currently under construction and it is a complete mess right now. If you’re flying soon, I would recommend getting here with some extra time as there are NO TSA PreCheck lanes available. With British Airways, LOT Polish and other international carriers also departing from Terminal 7, you might get stuck behind a wave of travelers unfamiliar with the security process (and no way to get around them). For full-fare first class passengers, Alaska Lounge members and Priority Pass cardholders, Alaska Airlines provides access to the brand new Alaska Lounge, located on the mezzanine level above security. The new Alaska Lounge is great and will give trans-con passengers a more relaxing place to chill and unwind prior to departure. The lounge is small, but spacious, and offers quality snacks and beverages options for all passengers. You can click here to read my full review of the new Alaska Lounge JFK. I left the lounge right at boarding time and arrived at gate 11 within a few minutes. General boarding had already started so I just jumped in line with everyone else. First Class and elite passengers boarded first and all passengers boarded through door 1L. As I boarded the aircraft, I threw my bags up in the overhead bins and took my seat. I’m a huge fan of these ex-Virgin America aircraft and I’m glad Alaska Airlines put them on these long trans-con flights. These first class seats are wide, spacious and comfortable and the onboard amenities help make the 6-hour flight fly by. Standard recliner seats don’t get much better than this. On this flight, I was seated in seat 2F, a window seat located on the right side of the aircraft. 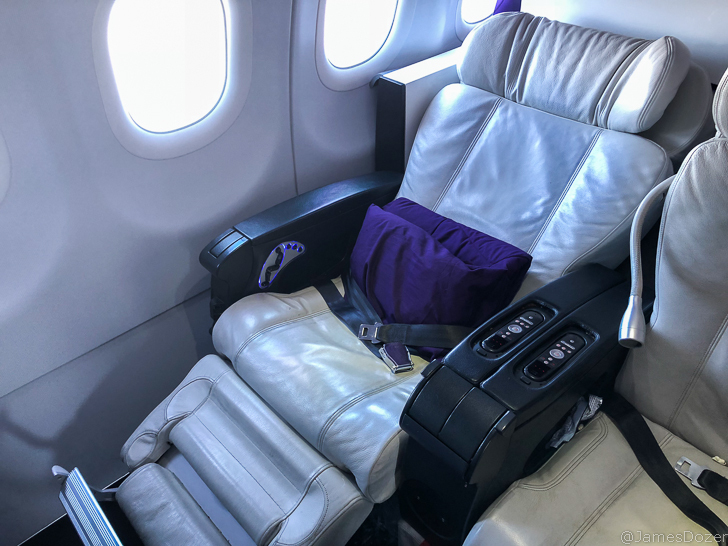 These ex-Virgin America aircraft are configured with two rows of first class seats in a 2-2 layout. These seats measure 21 inches in width and provide a whopping 55 inches of pitch. There is so much legroom! Waiting at my seat were a blanket, pillow, bottle of water and a pair of plastic headphones. As I settled into my seat, the flight attendant came by to offer me a pre-departure beverage and a menu card. Each seat features an in-flight entertainment system, which folds out from the center armrests. USB ports, individual electrical outlets and a personal reading lamp are also provided at each seat. In terms of entertainment, Alaska Airlines actually provides a great selection of Hollywood movies and TV shows to keep you entertained. You can expect about 40 newish Hollywood movies and another 40 indie and classic films. Not bad for an airline that doesn’t fly anywhere outside of North America. Exclusive for T-Mobile customers: Free internet for one hour. Free for all passengers: Free mobile chat on all compatible apps including iMessage, Whatsapp and others. After all the passengers were accounted for, the captain came on the PA to welcome everyone on-board and provide us with our flight time and estimated turbulence. We then pushed back from the gate, made our way to the runway and departed for our 5-hour and 30-minute journey back to Los Angeles. Once we reached our cruising altitude, the seatbelt signs were turned off and our flight attendant, Taylor, prepared for our meal service. Our tables were set and a pre-meal drink was served. Approximately 15 minutes later, she came by with a small ramekin of nuts, warm bread and a carrot and arugula salad plate. For my main dish, I chose the beef mole, which was served with a side corn cake and pineapple slaw. It was super delicious. The beef was tender and the dish was full of flavor. Unfortunately, I forgot to take a picture of it. Total noob mistake, I know. For dessert, we were served a small jar of Nancy’s Fancy Bourbon vanilla ice cream; simple yet delicious. There was only one meal service provided on this flight but first class passengers can order additional snacks (including any of the paid snack boxes) and beverages free of charge. This is a nice perk, as having something to munch on during a movie is always appreciated. Service-wise, there was only one flight attendant working the first class cabin but she was great. She was on her feet the entire time, serving food, refilling drinks and otherwise assisting passengers. She was polite, attentive and really went out of her way to take care of the passengers. In terms of seat comfort, domestic recliner first class seats don’t get much better than this. These ex-Virgin America seats are wide, spacious and have a ridiculous amount of recline. And with the attached leg rest, your legs can be elevated and supported for additional comfort and relaxation. It’s not a lie-flat bed, but it’s the next best thing. Overall, Alaska Airlines provides a quality first class product. 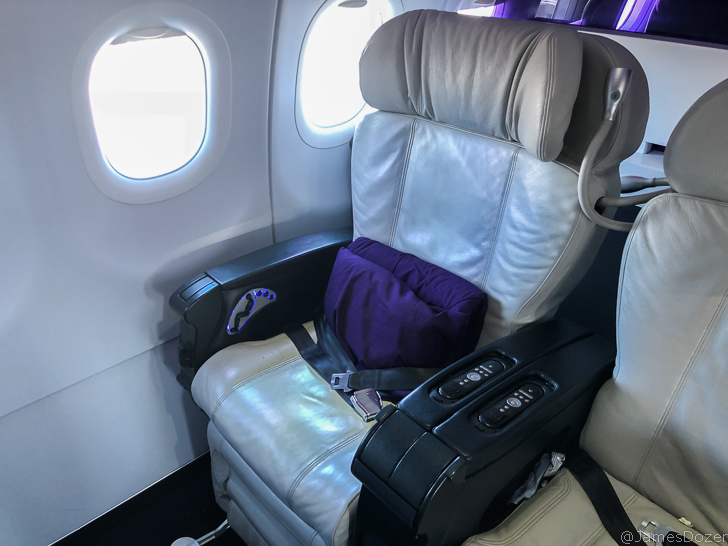 They don’t offer lie-flat seats or a consistent hard product across the board but what they do offer is a quality soft product experience. Alaska Airlines employees are some of the nicest employees in the industry and the amenities provided on-board are definitely appreciated. I’m a huge fan of Alaska Airlines and would recommend them to anyone. And if you can get on one of these ex-Virgin America aircraft, the experience will be even better.